Had a nice day at the ole’ Spa on Thursday. In six races we handicapped, we finished with three nice winners and four exacta hits. We finished the day with the Pick 3, as well. So, as we roll into one of the better Saturday race days of the year, let’s keep the momentum flowing, shall we? 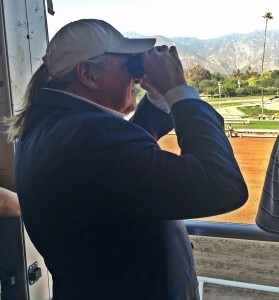 1st: 4-1-2-5…We will jump in on the first race, a high end MCL event for 2YO fillies. And, the main reason is that we have a main reason — Vampish (4). This daughter of Bodemeister goes for a trainer who hits with .17% of debut runners. He also hits with .18% of those making the first start in a MCL event. This one has been working OK for the initial start, and gets a top rider, who is winning at a .20% clip this meet. I really like this one here, especially in this less-than-daunting field — and she gets one of our Best Bets of the Day, right off the bat. Honey Parade (1) is a first timer for the barn of Bryan Lynch, who has a 2-0-3 record in just 7 starts here this meet — so far. That figures to be a .29% win rate. The sire wins with .17% of first timers, and the dam has 2 winners from 4 starters. Jockey is red hot, as well (9-7-4 in 35 starts over the last week). Figures. Ballybrack Lass (2) is the third first time starter that we like a bit in this race. This one has been working OK for a trainer who can score on the first race (.13% in 248 races). Dam has 4 winners from 4 starters. I bet the 4 to win/place/show and then key the 4 over/under all the other numbers listed. 5th: 5-2-6-7-9-4…This is another event where I will single in on a key horse, and in this case it is More Mischief (5). This daughter of Into Mischief cost $350,000 in March of this year, and now she will be making her first career start for the Chad Brown barn. Dam has 2 winners from 3 starters and this one has been smoking it in the a.m. Love the last two works, in particular — the last coming out of the gate. If she can pop out of the gate in good order, they all may have her to catch the entire way. Gets a top rider in the saddle, who wins at a .25% clip for this barn over the last 36 rides. She’s Trouble (2) has been favored in each of her first two starts for Linda Rice, and has been found wanting in each of them. She caught a sloppy track in the Stakes event last time out and still managed to get fourth — despite being squeezed at the start and going way, way wide in the stretch. A better un today can give this daughter of Into Mischief a chance. Give Me a Hug (6) was well bet on debut back in early May, but was wide throughout and didn’t muster much of a run or a threat at any time. Daughter of Uncle Mo is a homebred with some morning shine, though, and a nice work here on July 14. Has to improve, but has a chance. I bet the 5 to win/place/show and then key the 5 over/under the rest of the numbers — with more on top. I key on top/under the 2-6-7 more, as well. 6th: 6-10-5-8-3-7-4…I will focus on the top two numbers in this sequence, led by Hannah’s Smile (6). this one has a 2-1-2 record in the first 8 starts to the career and is coming out of a race where she nearly won while stalking the lead from the get-go. Has won against Open Company in the past, and that’s a huge plus for me. I like the work here on July 25, and the fact that the trainer has hit the board in 10 of 17 starts this meet. Horses from this barn are running very well right now. Beaux Arts (10) is another one that goes for a relative unknown trainer in these parts, but this one has been running very well in Open Company, as well. Will get back to the turf today after being washed off the surface last time out. I throw that event completely out, and the filly has two nice seconds at this distance in a row. She likes the lead, or close to it. Will have to get a quick jump to save some ground from here. Miss Mystique (5) has two fifth place finishes over the sod in the last two outs, but both of those were against much tougher competition. Should like the retreat into this company today. Could spice up the exotics at 8-1 ML odds. I bet the 6 to win/place/show and then box the top 3 in the exacta. I key the top 3 over the rest in a smaller version. 7th: 2-1-6-3-4…War Value (2) is a 3YO War Front filly, who will be making her second start off a layup. Trainer hits with .25% of those, and this one should benefit greatly from the exercise on June 30. Was right in the thick of that one before tiring late in the running. Still only lost by 21/4 lengths. Now switches to the dirt for the first time and the trainer hits with .24% of those making this surface conversion. I like the move, especially considering the work her on July 27. Anne Dupree (1) is a well-bred Curlin filly trained by the former Pletcher assistant — Jonathan Thomas (of Catholic Boy fame). This one is converting to the dirt, as well, and is coming off a near miss win over a soft grass course at Pimlico on May 18. Like the work here on July 29. Got Lasix back the last time out and ran much, much better. Has it again today. Take note. We Are Family (6) has a second and a third in the last two times out, and switches to a high percentage jockey today. Sharp 3F work here on July 31 should peak the speed a hair, and that may be enough in this spot. I bet the 2-1 across the board and then box the top 3 in the exacta. 8th: 4-3-10-1-9-6-5-7-8-2…I will focus my attention on the top 2 numbers in this spot, led by Holland Park (4). This 3YO Tapit colt is trained by Kiaran McLaughlin for the Godolphin Stables. Has not run since April 21, but ran a huge second in the Frederico Tesio Stakes in that event, and that is normally a prep for some to show up in the Preakness Stakes next. This one has a win and three seconds in just 4 career starts, and looks to be training well for the return to serious action. I love the choice of Joe Bravo in the saddle. This guy can ride. Period. And, he has a 3-2-1 record in only 14 mounts so far this meet. Give me a break guys. Give the guy a chance and he will ride his best. Has a wonderful year for agent Jimmy Riccio. Proven Reserves (3) won for ease at Aqueduct back in April. Was off until June 9 and ran a disappointing fifth as the big favorite in the return. Training well and gets blinkers for the first time today. Trainer hits with .23% of those getting the shades for the initial time. This one cost $350,000 as a Keeneland September Yearling. Can’t dismiss. Weather Wiz (10) broke the maiden last time out and will get to face winners for the first time today. Trainer hits with .23% of those moving up this class level, though, and this one threw a bullet move on the morn of July 28. Looks solid right now and has never been worse than third in five career tries. Must use for me. I bet the 4 to win/place/show and then box the top 3 in the exacta. I key the 4 over/under the 3-10-1-9 in two more exactas, as well. 9th: 6-2-4-5-7-11-1-9-3-8…G2 Hall of Fame Stakes…I like the top 3 numbers in this sequence, led by Gidu (6), in a well-balanced and deep event. This 3YO son of Frankel is trained by Todd Pletcher and is coming off a 6th place finish in the Group 1 Commonwealth Cup at Royal Ascot in the last effort. Don’t be disappointed in that performance, though. There were 22 horses in that event and this one lost by less than 3 lengths. He led for much of that tilt before tiring late. Now, he gets back to the U.S. where he has never been worse than second. Will be stretching out to a new distance for the very first time. That is my lone hesitation, but I think he is bred to love the extra distance. Maraud (2) won the G2 American Turf at Churchill Downs over a yielding course on KY Derby Day. Has returned to run off the board in the last two with very strange runs in both of those. The first was in the Penn Mile, when he was put on the lead for some reason and faded late. The latter came in the G1 Belmont Derby, when he was stuck 3-wide throughout a 11/4-mile endurance test. Gets a new rider today, and I applaud the move. Raging Bull (4) is trained by Chad Brown and may be the horse to beat. Steps up in class today, but this one has two wins and a second on the resume, and is training well, to boot. Look out. I bet the 6 to win/place/show and then box the top 3 numbers in the exactas. I key the top 3 over the rest in a smaller version.